Lighting is so important because it really can make or break a room, the wrong choice will affect colours and even mood. 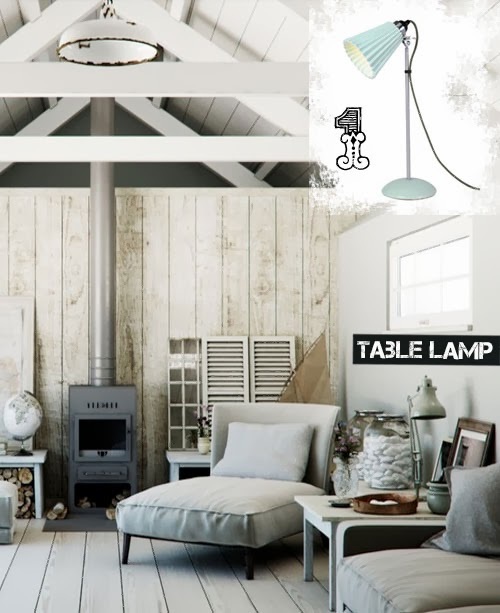 Here is a selection of simple task lighting with an emphasis towards metals and the still trending industrial edge. However small, each lamp in this series has an architectural feel - sleek, dramatic and functional. The table lamp in image 1 provides incredibly subtle detailing and the choice of chalky grey blends perfectly with the surrounding coastal-look decor. If you are wanting to take the colour coded approach, try this elegant handmade in Britain BTC Hector Pleat table lamp from Heals in a beautiful pastel green. 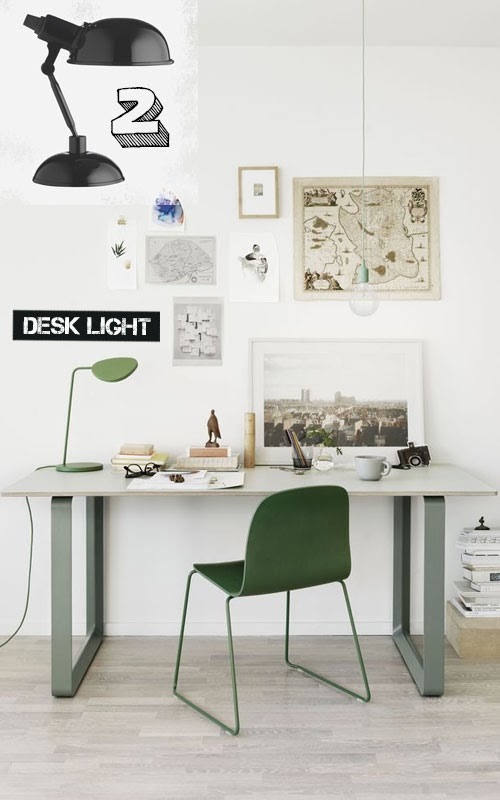 The desk light in image 2 not only serves as a vital task light but also provides an accent colour in apple green. For a simple & very affordable desk light, try the timeless metal Tommy lamp from Habitat in black or vibrant yellow, currently at £12. How dramatic do these monumental ceiling shades look in image 3!? I am huge advocate of low hanging lighting in a dining setting but with lighting of this scale be sure to have a dimmer option to tone down the brightness in favour of a more relaxing shade for dinner. 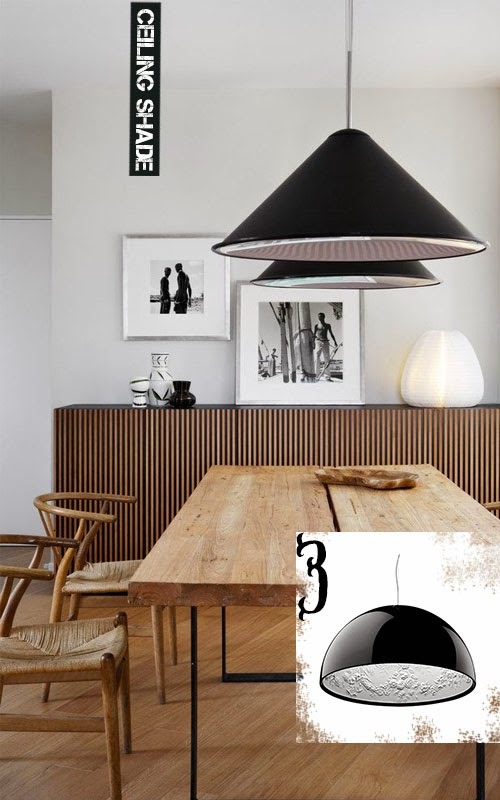 Equally dramatic is this Skygarden 1 pendant shade by Dutch designer Marcel Wanders and available from The Conran Shop - I love the contrast between the glossy black exterior die-cast aluminium and the softer relief pattern inside. 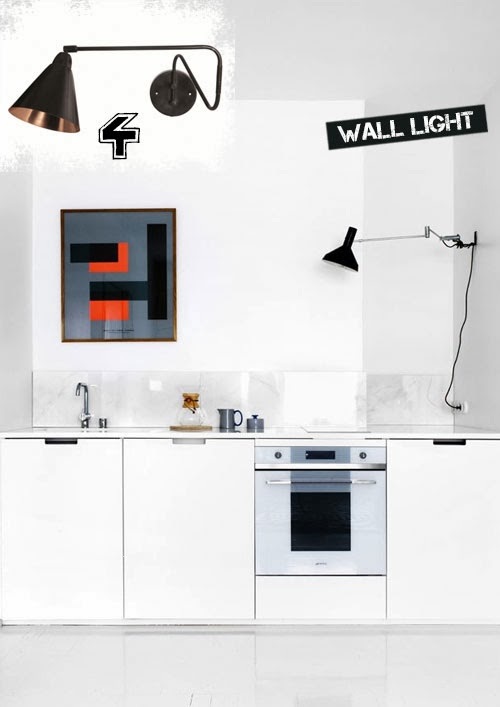 The monochromatic look continues in the strikingly slick kitchen design 'above' which is accentuated by the simple wall light as it creates a silhouette effect against the brilliant white wall in image 4. 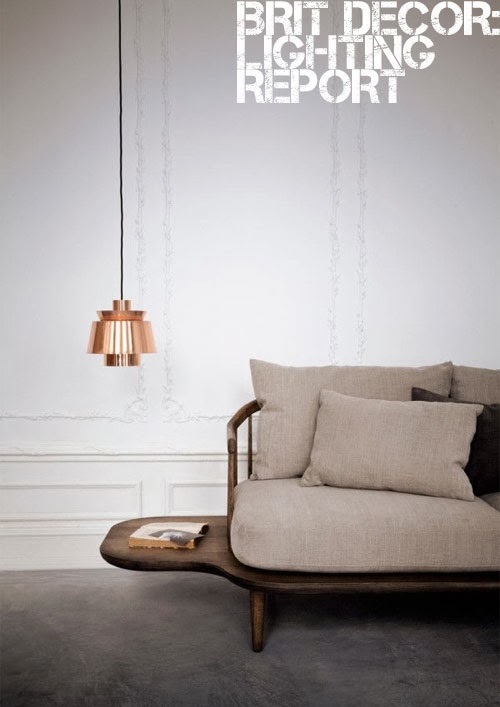 To replicate this look, try this New York wall light from Bodie and Fou - the twisted arm and the pairing of black and copper colours is stunning. The beautiful copper pendant lights in image 5 bring an instant luxe-look to their settings and have that oh-so popular distinctive mid-twentieth century style. For a truly luxurious feel, try grouping together several pendant lights. 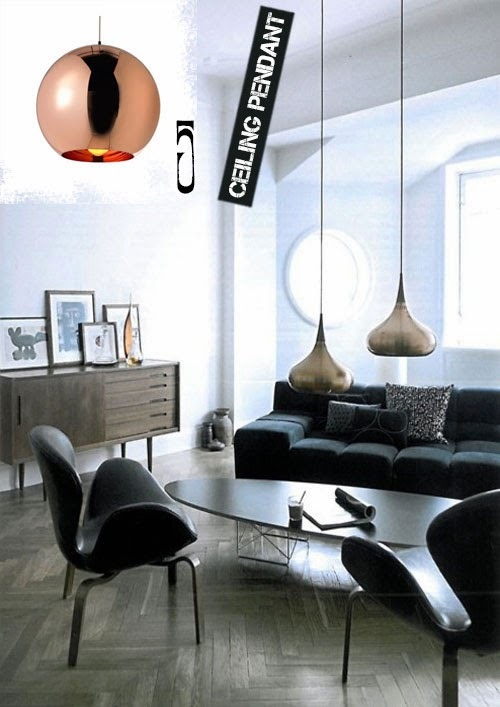 This Tom Dixon copper pendant from Heals has all the style and glamour of an early James Bond movie! I adore copper objects around the house at this time of year, it's such a warm coloured material and the reflective qualities serve to bounce light around a room like copper flames. 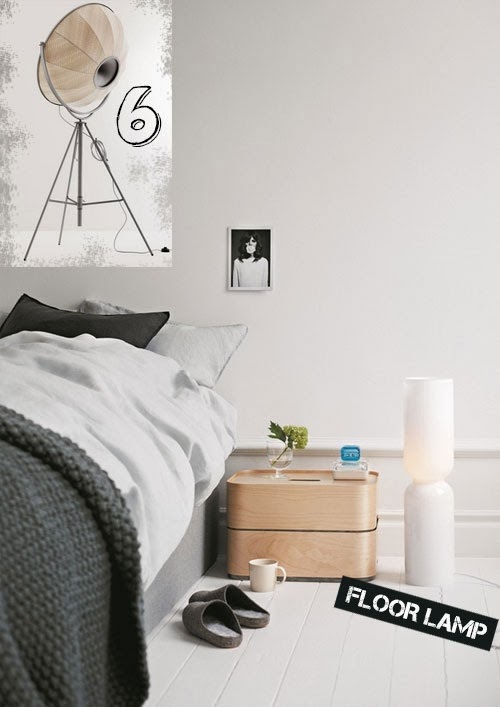 The simple white floor lamp in image 6 is so unobtrusive and also a source of beautiful ambient light - great for that softer bedroom feel. Why not create a studio-style look with this sophisticated Fortuny 1985 floor lamp from twentytwentyone? I couldn't resist slipping two floor lights into this feature so the second example in image 7 has a strong architectural design as it towers over the sofa and links perfectly with the simple black picture frames. I love how the stylist has softened the masculine monochromatic elements by adding elegant white flowers and a soft wool rug. 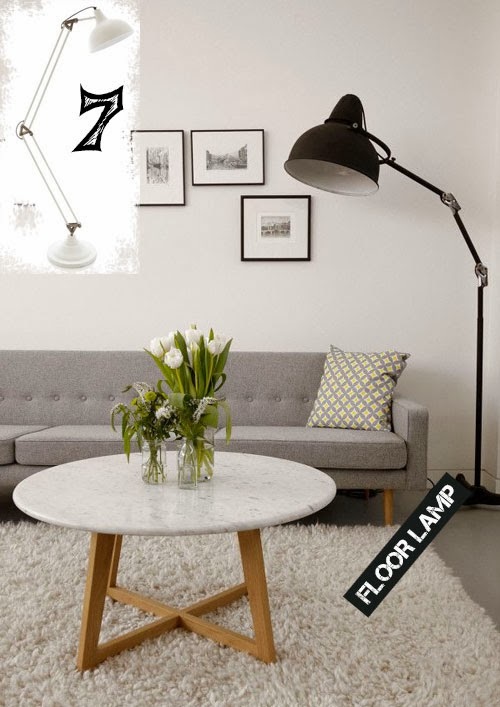 For a minimal look, how about this elegant and statuesque white Steel Knuckles floor light from French Connection Home? So do you have a favourite type of lighting?